The piece is located directly in the West Acres Shopping Center in Fargo, a prime location to disseminate popular art from local artists to the masses. 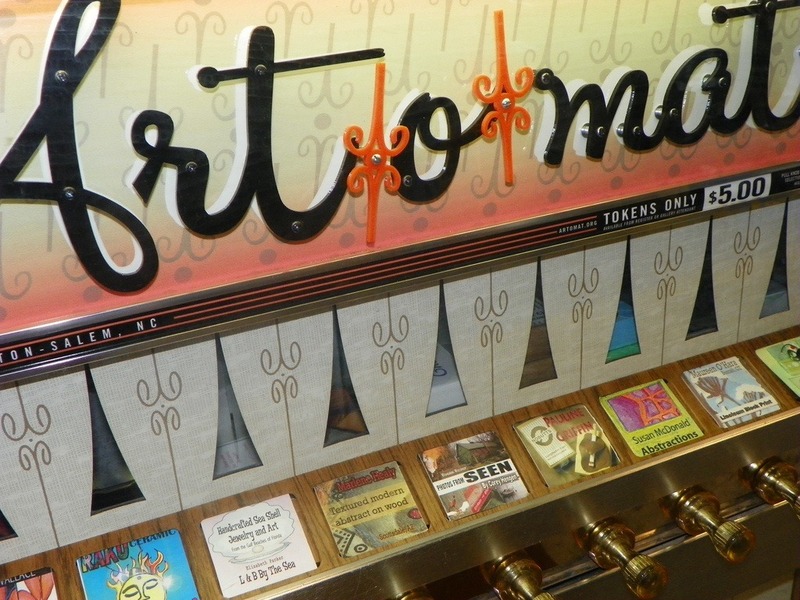 But, this isn’t the first Art-o-Mat in the United States. Art-o-Mat displays are located throughout the United States and in Canada, Australia, and even Austria and the United Kingdom. In 1997, artist Clark Whittington created the first Art-o-Mat with the intention to distribute his art pieces to his community. What was meant to be a temporary installation at a coffee shop quickly became a permanent piece at the café and grew and expanded on a national level. Artists in Cellophane, which makes the Art-o-Mat project possible, expanded Whittington’s concept in order to integrate public art, artist promotion, and art accessibility. In North Dakota, the installation is made possible through collaboration with The Arts Partnership. The project was brought to the Fargo area through a specific process that involved funding partners, collaborative partners, and participation of artists. This public art piece offers a tremendous opportunity that benefits the community and the local artists. Not only do local artists have their artwork promoted and disseminated, but they also receive a 50% portion of the proceeds when the public purchases (for $5) a piece of art from the machines. This isn’t the first innovative way to disseminate art to a community. Many other methods have been employed to make art accessible and obtainable to a community and its residents. For example, in Detroit, digital media has driven accessibility of the arts to new levels. The Detroit Orchestra made symphonic music more accessible when it asked its audience to help them create a uniquely Detroit music compilation piece through a free app. Major digital and online industries have also realized the interest of public consumption of art and culture and tailored their sites to accommodate this growing need. Now, from your own home, in a click you can view art masterpieces from the Google Cultural Institute and Google Open Gallery. No longer are art and culture confined to physical space in this new era. The San Francisco Museum of Modern Art (SFMOMA) offers a new service that allows anyone to receive an image of a piece of art chosen from the museum’s entire collection, curated to their mood.